There are eight categories to cover the broad range of environmental enhancement projects and activities happening in Taitokerau. A Supreme Award will also be presented for the most outstanding entry. This award recognises individuals or groups who are working collaboratively within their community to protect and improve Northland’s environment. This award recognises individuals or groups who are committed to projects and activities that support pest management in Northland. This award recognises those in the education sector that are driving learning and action to bring about change on environmental issues. The award is specific to schools, kura Māori, early childhood centres or tertiary institutions, and can include the whole school, groups or individuals. This award recognises individuals, groups and businesses who are taking action to protect and enhance water quality and biodiversity values within water bodies in Northland. This award recognises businesses that demonstrate sustainable practices which contribute to the sustainable development of natural resources in Northland. This award recognises an individual or group whose leadership, support of others and willingness to share ideas and resources is making a significant contribution to Northland’s environment. 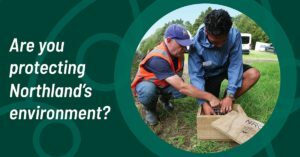 This award recognises those who have demonstrated innovation and initiative in protecting, restoring or enhancing Northland’s environment. This award recognises the unique relationship tangata whenua have with natural and physical resources in accordance with tikanga Māori, and is open to whānau, hapū, iwi and Māori organisations. Nominations close on close at 5pm on Sunday, 31 March 2019.